Did you just get a new Instant Pot as a gift? Perhaps you have one sitting in the closet collecting dust because you just don’t know what to do with it. More likely, if you own one, you are like myself and it lives on your counter top because you use it so often! Electric Pressure Cookers are a fantastic kitchen appliance for making quick, easy and super tender meat. They also work great for soup, pasta dishes and more! 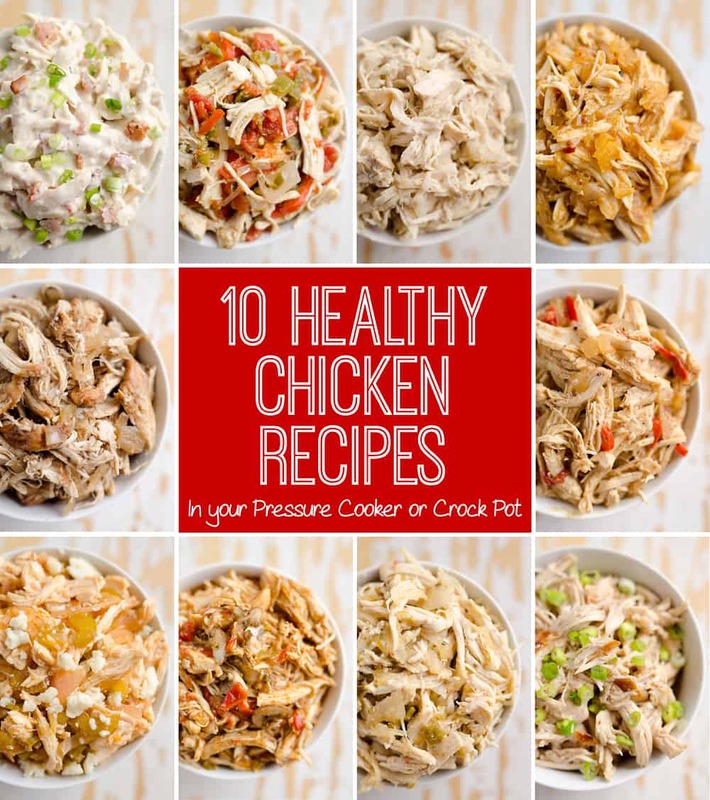 I am sharing my favorite 10 Healthy Chicken Recipes in a Pressure Cooker or Crock Pot for great go-to recipes you will make again and again. Serve them with a side of rice, top a pizza crust, make a sandwich or use them to make a quick soup. The ideas for these easy chicken recipes are endless! The best part of all, is that whether you make a single batch or multiple varieties, these freezer-friendly chicken recipes freeze up great for last minute meals at another time. If you are looking for another great resource for meal planning, be sure to check out this Free Printable Meal Planner + Calendar. 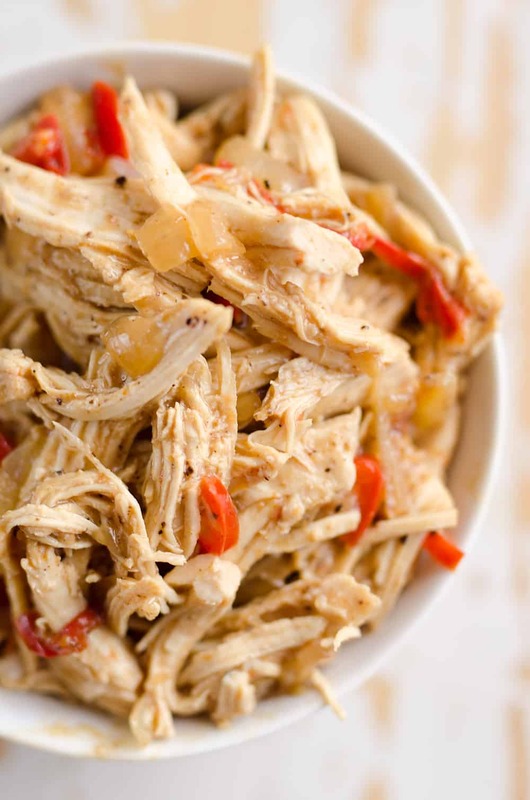 You can throw your frozen chicken breasts in the Instant Pot along with the liquid and spices and you will have tender shredded chicken ready in less than 30 minutes. It really doesn’t get any better than that. No more thawing the chicken in your microwave last minute, which results in rubbery and unevenly cooked meat. 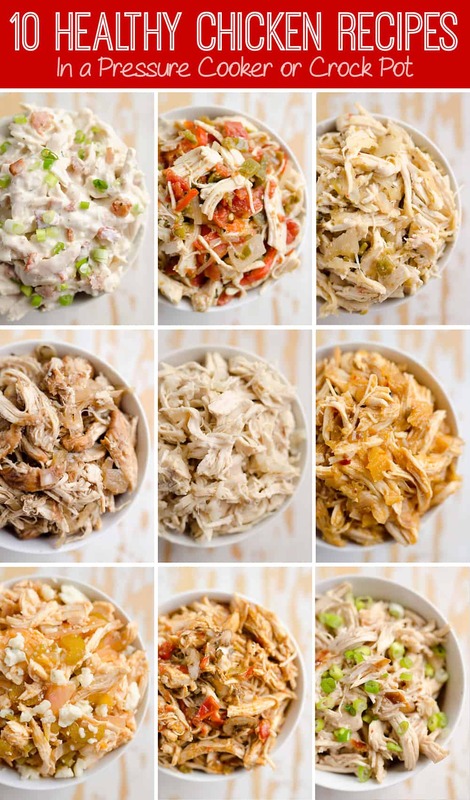 If you don’t own an Electric Pressure Cooker, you can make all of these chicken recipes in your Crock Pot for a simple set it and forget it meal. 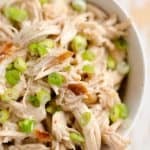 For those of you who are new to an electric pressure cooker, be sure to check out my Tips and Tricks for the Perfect Pressure Cooker or Crock Pot Shredded Chicken at the end which answers lots of common questions. *NOTE* These recipes are intended for a 5qt or 6qt electric pressure cooker. If you are using a larger 8qt pressure cooker, you will need to increase the amount of liquid. 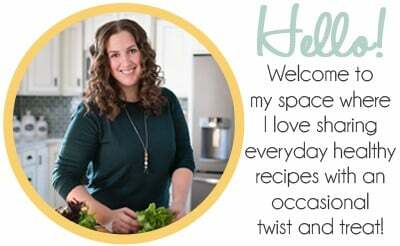 Be sure to subscribe to my newsletter HERE so you never miss a recipe! This Italian Chicken is a rich mixture of sauteed vegetables and shredded chicken in marinara sauce with a pop of flavor from pesto. Electric Pressure Cooker - Turn your Instant Pot to Saute and add the olive oil, onion, bell peppers and salt. Saute for 3-4 minutes or until the vegetables are softened. Add the marinara, pesto and chicken. Cook thawed chicken on high pressure for 12 minutes. (Cook frozen chicken on high pressure for 20 minutes.) Turn the pressure valve to “Vent” to release all of the pressure. Remove ⅔ cup of liquid from the pot, being careful to leave the vegetables. (Reserve the liquid for cooking rice or making soup.) Add the mushrooms to the vegetables and set to saute for 2-3 minutes until mushrooms are slightly softened. Return the shredded chicken to pot and stir until well combined. Crock Pot - Add the chicken breasts to a sprayed or lined Crock Pot. Drizzle with olive oil and sprinkle with salt. Top with the bell peppers, onion, marinara and pesto. Add an additional ½ c. marinara. Cook on low for 4-5 hours. 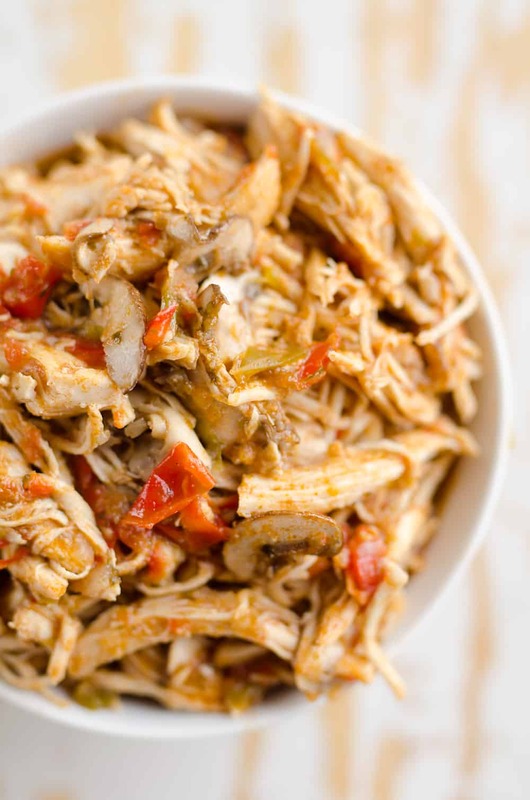 With 30 minutes of cooking time left, shred the chicken using two forks and add the mushrooms. Top a flatbread with Italian Chicken and shredded cheese. Fill bell peppers with chicken and rice and top with cheese for stuffed peppers. Make a soup with the Italian Chicken, mirepoix (chopped onion, celery and carrots), chicken broth, rice, garlice and a little more marinara. Make a wrap filled with Italian chicken, lettuce, Italian dressing, cheese and tomatoes. A sweet and savory flavor combo perfect for salads or served with rice. An easy 3 ingredient recipe with bright Mexican flavors. Electric Pressure Cooker - Add the onion, salsa verde and chicken to the Instant Pot. Cook thawed chicken on high pressure for 12 minutes. (Cook frozen chicken on high pressure for 20 minutes.) Turn the pressure valve to “Vent” to release all of the pressure. Remove ⅔ cup of liquid from the pot. (Reserve the liquid for cooking rice.) Return the shredded chicken to pot and stir until well combined. Top chicken with green onions. Crock Pot - Add the chicken breasts to a sprayed or lined Crock Pot. Top with the salsa verde and onions. Add an additional ½ c. salsa verde. Roll the Salsa Verde Chicken in flour tortillas and place in a sprayed baking pan. Top with green enchilada sauce and cheese and bake the enchiladas. Make a Southwest Penne & Romaine Salad. Cover half of a large flour tortilla with Salsa Verde Chicken and cheese. Fold over and grill for a quesadilla. Make a salad by topping a bed of lettuce with chicken, pico de gallo and queso fresco. Toss the salad with salsa ranch. A sweet and savory flavor combo with crushed pineapple and spicy BBQ sauce. Remove ⅔ cup of liquid from the pot. (Reserve the liquid for cooking rice.) 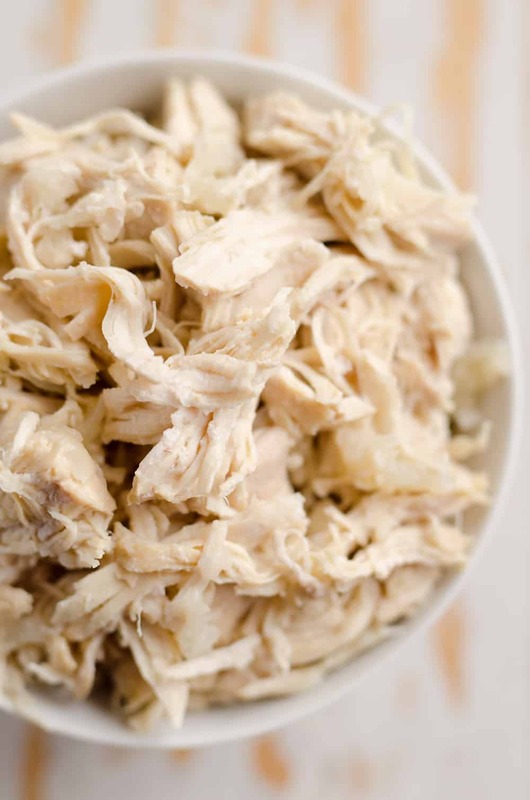 Return the shredded chicken to pot and stir until well combined. Crock Pot - Add the chicken breasts to a sprayed or lined Crock Pot. Sprinkle with the salt and top with the crushed pineapple and bbq sauce. Add a ½ c. chicken broth or pineapple juice. Fill Hawaiian buns with chicken, extra BBQ sauce and cheese and top with melted butter and onion flakes and bake the sliders. Make a BBQ Chicken & Pineapple Tostada. Top a pizza crust with Hawaiian BBQ Chicken, green onion and cheese. Make a wrap with Hawaiian BBQ Chicken, avocado, red onion and lettuce. A rich and delicious mixture of Thai peanut sauce and vegetables with tender shredded chicken. 1 c. Thai peanut sauce <- I highly recommend using this recipe! Electric Pressure Cooker - Turn your Instant Pot to Saute and add the olive oil, onion and bell peppers. Saute for 3-4 minutes or until the vegetables are softened. Add the Thai peanut sauce and chicken. Cook thawed chicken on high pressure for 12 minutes. (Cook frozen chicken on high pressure for 20 minutes.) Turn the pressure valve to “Vent” to release all of the pressure. Remove ⅔ cup of liquid from the pot, being careful to leave the vegetables. (Reserve the liquid for cooking rice.) Return the shredded chicken to pot and stir until well combined. Fill pieces of butter lettuce with chicken and top with chopped peanuts, cilantro, shredded carrots and green onion for lettuce cups. Roll chicken up in egg roll wrappers with broccoli slaw and bake until crispy. Make a Thai Peanut Flatbread. Saute with red cabbage, snow peas, carrots and green onions and top with crispy wonton strips and peanuts. 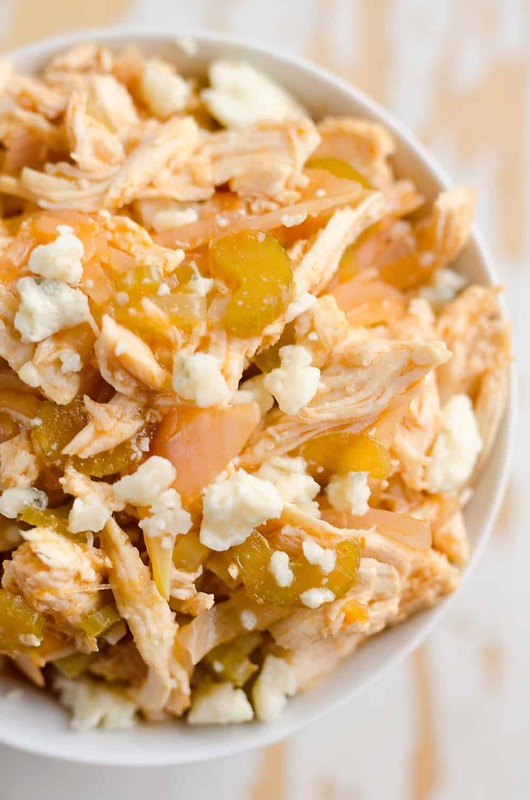 This sweet and savory chicken recipe is perfect for salads and Greek dishes. Electric Pressure Cooker - Add the balsamic vinegar, honey, chicken broth and Dijon to the Instant Pot and whisk until well combined. Add the onion, garlic, thyme and chicken. Cook thawed chicken on high pressure for 12 minutes. (Cook frozen chicken on high pressure for 20 minutes.) Turn the pressure valve to “Vent” to release all of the pressure. Crock Pot - Add the chicken breasts to a sprayed or lined Crock Pot. In a small bowl, whisk together the balsamic, honey and dijon. Top the chicken with the mixture along with the chicken broth, onion, garlic and thyme. Add an additional ½ c. chicken broth. Top a flatbread with Honey Balsamic & Onion Chicken, cherry tomatoes, tomatoes and goat cheese. Make a salad by topping a bed of lettuce with Honey Balsamic & Onion Chicken, tomatoes, cucumbers and feta. Whisk some of the reserved juices with some olive oil and lemon juice for a quick vinaigrette. 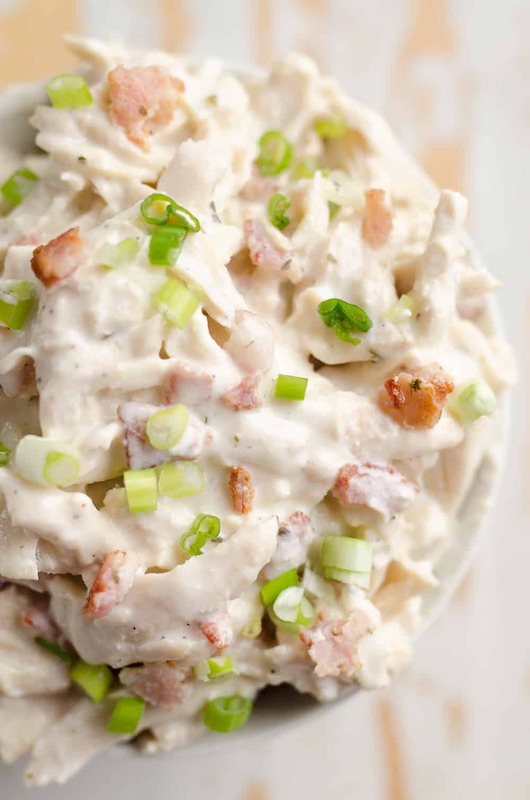 This rich and creamy mixture of chicken, bacon and ranch is lightened up for a creamy dish you will love! Electric Pressure Cooker - Turn your Instant Pot to Saute and add the chopped bacon. Saute for 3-4 minutes or until the bacon is crisped. Add the chicken broth, ranch seasoning and chicken. Cook thawed chicken on high pressure for 12 minutes. (Cook frozen chicken on high pressure for 20 minutes.) Turn the pressure valve to “Vent” to release all of the pressure. Remove ⅔ cup of liquid from the pot. (Reserve the liquid for cooking rice.) Add the cream cheese and set to saute for 2-3 minutes until the cream cheese is completely melted. Return the shredded chicken to pot and stir until well combined. Top with diced green onions. Crock Pot - In a skillet or in the microwave, cook the bacon until crisp. Add the chicken breasts to a sprayed or lined Crock Pot. Top with the ranch seasoning and chicken broth. Add an additional ½ c. chicken broth. Cook on low for 4-5 hours. With 30 minutes of cooking time left, shred the chicken using two forks and add the cream cheese and crumbled bacon. Top with diced green onions. Top a split baked potato with chicken and shredded Cheddar. Top a flatbread with chicken, green onion and shredded cheese. 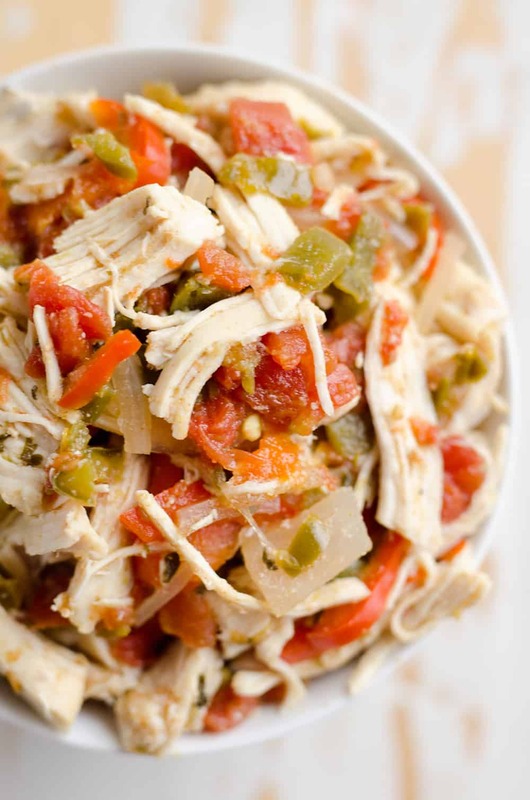 This Mexican blend of shredded chicken and vegetables is perfect for the spice lovers! If you don't like your food extra spicy, cut back on the jalapeños for a more mild spice. Electric Pressure Cooker - Turn your Instant Pot to Saute and add the olive oil, onion, bell peppers and salt. Saute for 3-4 minutes or until the vegetables are softened. Add the Rotel, jalapeños, garlic powder, cumin, chili powder, chicken broth and chicken. Cook thawed chicken on high pressure for 12 minutes. (Cook frozen chicken on high pressure for 20 minutes.) Turn the pressure valve to “Vent” to release all of the pressure. Remove ⅔ cup of liquid from the pot, being careful to leave the vegetables. (Reserve the liquid for cooking rice or making soup.) 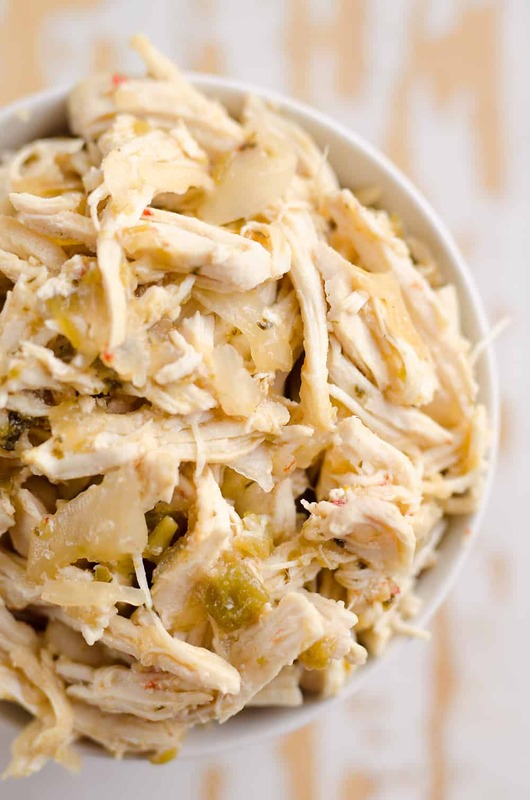 Add the lime juice and return the shredded chicken to pot. Stir until well combined. Crock Pot - Add the chicken breasts to a sprayed or lined Crock Pot. Drizzle with olive oil and sprinkle with salt and seasonings. Top with the bell peppers, onion, Rotel, jalapeños and chicken broth. Add an additional ½ c. chicken broth. Cook on low for 4-5 hours. With 30 minutes of cooking time left, shred the chicken using two forks and add the lime juice. Top a pizza crust with refried beans, Spicy Mexican Chicken and cheese. Top half of a large flour tortilla with Spicy Mexican Chicken and shredded cheese. Grill until cheese is melted for a quesadilla. Roll the chicken in flour tortillas and place in a baking pan. Top with enchilada sauce and cheese and bake the enchiladas. 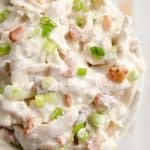 A spicy classic with buffalo sauce, onions and celery with tender shredded chicken. Electric Pressure Cooker - Add the celery, onions, wing sauce, chicken broth and chicken to the Instant Pot. Cook thawed chicken on high pressure for 12 minutes. (Cook frozen chicken on high pressure for 20 minutes.) Turn the pressure valve to “Vent” to release all of the pressure. Remove ⅔ cup of liquid from the pot, being careful to leave the vegetables. (Reserve the liquid for cooking rice.) 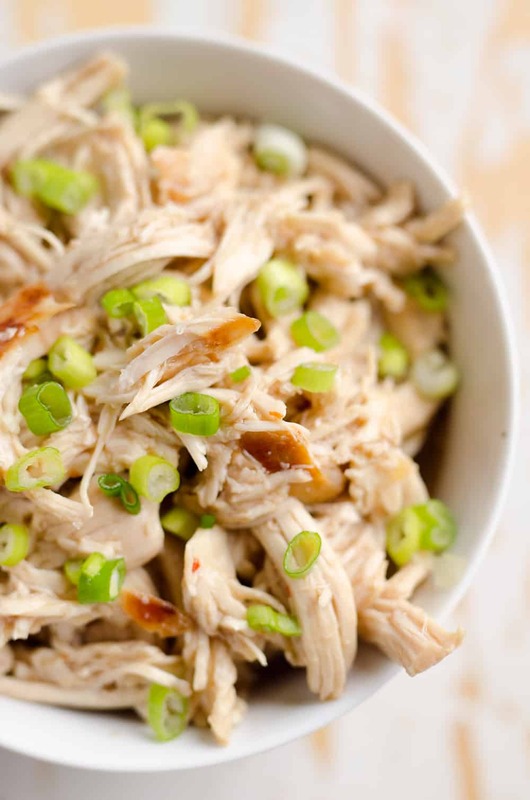 Return the shredded chicken to pot and toss with the bleu cheese crumbles. Stir until well combined. Crock Pot - Add the chicken breasts to a sprayed or lined Crock Pot. Top with the buffalo wing sauce, celery, onion and chicken broth. Add an additional ½ c. chicken broth. Cook on low for 4-5 hours. With 30 minutes of cooking time left, shred the chicken using two forks and add the bleu cheese crumbles. Roll the chicken in flour tortillas and place in a baking pan. Top with red enchilada sauce and shredded cheddar and bake the enchiladas. Top a split baked potato with Buffalo Chicken and shredded Cheddar. Make a Cheesy Buffalo Chicken French Bread. Top grilled corn tortillas with chicken, chopped tomatoes and bleu cheese for Buffalo Chicken Tacos. Make a Buffalo Chicken Wrap. This simple recipe is the perfect chicken to add to your favorite salads or casseroles. Electric Pressure Cooker - Add the onion, garlic, salt, chicken broth and chicken to the Instant Pot. Cook thawed chicken on high pressure for 12 minutes. (Cook frozen chicken on high pressure for 20 minutes.) Turn the pressure valve to “Vent” to release all of the pressure. Remove ⅔ cup of liquid from the pot. (Reserve the liquid for cooking rice or making soup.) Return the shredded chicken to pot and stir until well combined. Crock Pot - Add the chicken breasts to a sprayed or lined Crock Pot. Sprinkle with salt and top with the garlic, onion and chicken broth. Add an additional ½ c. chicken broth. Make a Ranch BLT Chicken Salad Sandwich. Make Chipotle Chicken Salad Stuffed Avocados. Make a soup with the chicken, mirepoix (chopped onion, celery and carrots), chicken broth and noodles. Add to your favorite salad. Make Creamy Chipotle Chicken Tomato Soup. These cooking times are for small to average size chicken breasts. If you are cooking huge chicken breasts (12 oz. or larger), increase the cooking time in your Instant Pot by 5-10 minutes. For the Crock Pot, add 1-2 additional hours of cooking time. There is no need to add additional water to these recipes. Each recipes has the roughly 1 cup minimum required by an Instant Pot. 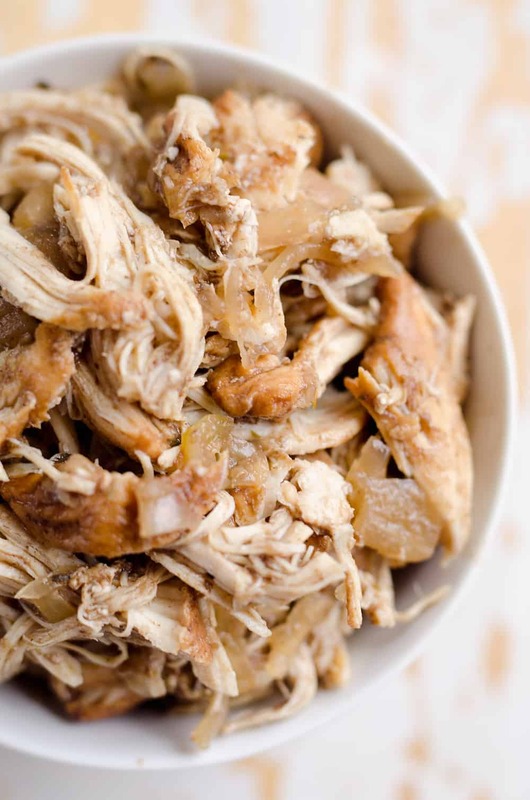 Pressure Cooker – reduce the amount of chicken to 1lb and remove 1 full cup of liquid from the Instant Pot before adding the shredded chicken back instead of the 2/3 cup it calls for to remove. Crock Pot – reduce the amount of chicken to 1lb and don’t add the additional 1/2 cup of liquid it calls for. Pressure Cooker – increase the amount of chicken to 3 or 4lb and don’t remove any liquid from the Instant Pot. You can optionally increase the amount of vegetables if desired. 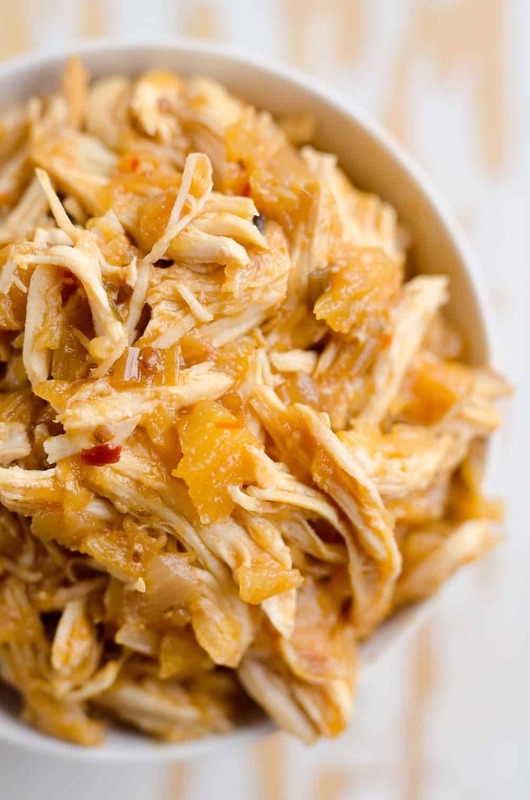 Crock Pot – increase the amount of chicken to 3 or 4lb and add 1 extra cup of liquid. 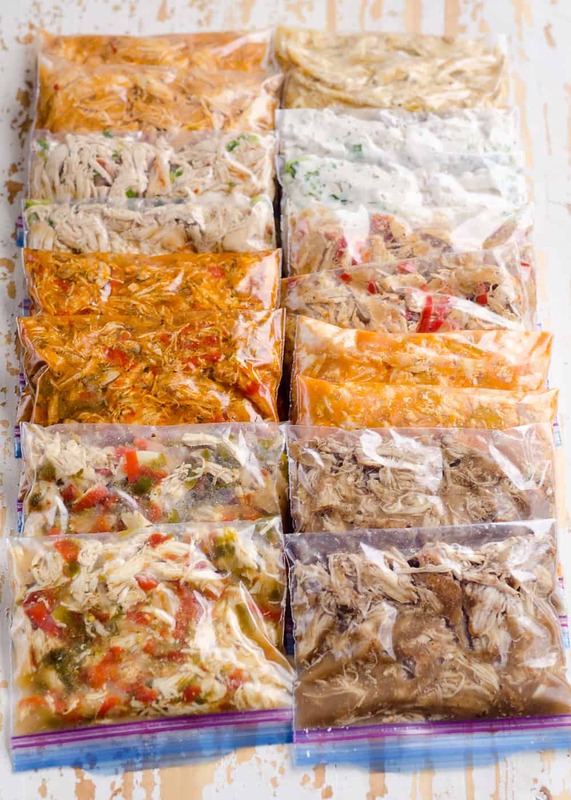 Freeze leftover chicken in resealable freezer bags for easy last minute meals. If you freeze your prepared chicken recipe and want to thaw it later, break it into large chunks and place it in a small metal or glass bowl. Place the bowl on the trivet in your Instant Pot with 1 cup of water in the bottom of the pot. Cook on high pressure for 3 minutes with a quick release and it should be thawed and heated through nicely! Use the reserved liquid from the Instant Pot recipes when making rice for added flavor. It also works great for soup bases. If you don’t need it right away, freeze it for later. look for recipes for my electric pressercooker. Thanks so much Adriana, I hope you enjoy some of them! Completely agree with you. Love the simplicity of these recipes and yet the variety! Can I make these with my regular, stove-top pressure cooker? They look great. I have a stove top pc. I followed the recipe exactly. It turned out great. 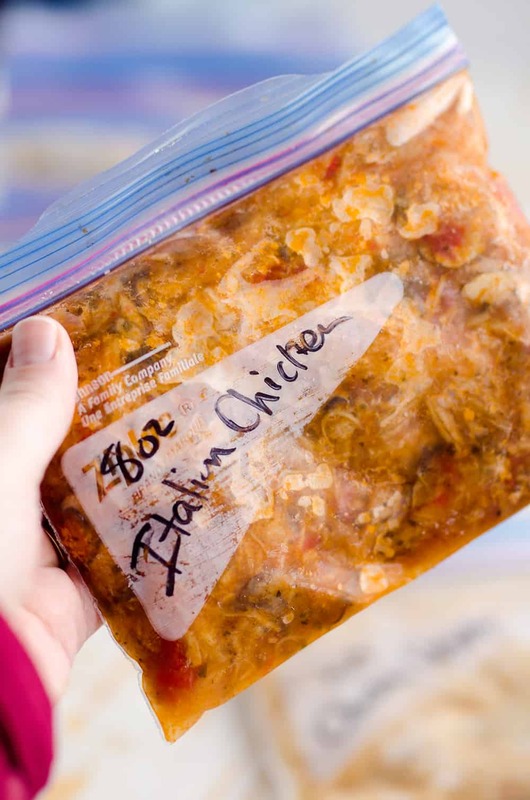 Can frozen chicken be used in the crock pot versions? Yes! You will just want to increase the cooking time to about 6 hours on low. This might sound like a silly question but by freezer friendly do you mean that you cook the recipe THEN freeze it and heat it later, or do you prep the ingredients to freeze and cook later? I meant that after cooking up a batch of chicken it freezes great for easy reheating later. You could prep some of the recipes that call for chicken broth ahead of time for the Pressure Cooker and freeze. Those ones I would freeze everything in a container EXCEPT the chicken broth because you will need to add that liquid right before cooking so the Instant Pot can come to pressure. If you plan on making them in the Crock Pot, you could absolutely prep all of them ahead of time and just add an hour or 2 to the cooking time if cooking straight from frozen. 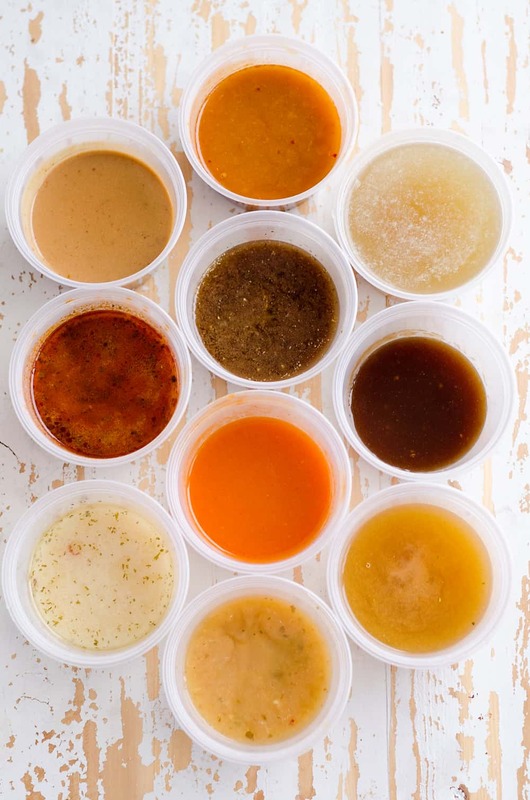 Would you put all of the leftover broth in the bags when you freeze them? I would store the leftover broth separately from the chicken. 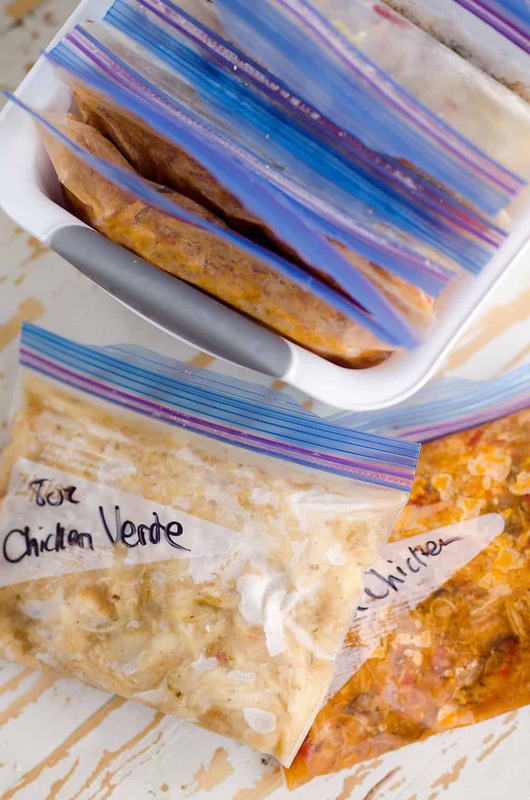 A tip from my mother – in – law, she would freeze leftovers in PAM sprayed, square flexible (disposable type) plastic containers, and once frozen, pop them out and put into long -term marked freezer bags. This way they stack nicely in the freezer. These recipes are very easy to follow. LOVE the suggested uses for the chicken at the end of each recipe. My go to is lettuce wraps for all types of shredded chicken. The added toppings take it up a notch. Wow – these look fantastic! Thank you so much – they’re exactly what I’ve been looking for. You are very welcome, I hope you enjoy them! Wow! Thank you! I love the serving suggestions… So helpful. I have only done the water test in my instant pot. If i double the chicken amount in the above recipes, should I double the liquid also? No need to double the liquid. If you are doubling the chicken in some recipes with additional ingredients, you might want to add a little more of those though. I have Interstitial Cystitis which makes cooking sometimes difficult. At least half of your recipes were manageable or easily converted for me. This awesome! Thank you! I am so happy you were able to make some of these work for you Jennifer! I just wanted to say thanks for this idea. I really used it and I cannot tell you how much I appreciated the direction. Don’t get me wrong, I used several recipes that I have but I did use 3. The others I used was a ginger chicken recipe, and a chicken taco recipe I already had. However, the idea is superb and I love the meal-planning. I struggle with this because I’m single and I travel a lot and I worry about expired fresh food all the time. With this, this is great. I’m happy to hear it was useful to you! New Instant Pot user here – do I need to put the chicken on the included trivet-thing when I cook it, or can it just go directly on the bottom of the pot? Thank you! Directly in the pot is fine! Danielle, can these recipes be adapted for the Pot-in-pot (PIP) cooking method? Example: put another pot inside the pressure cooker’s removable outer pot, with the recipe ingredients (perhaps less broth) inside (use the trivet, cover smaller pot with foil), and then put 1c steam water in the outer steam pot to ensure steaming? I ask this because I would like to intensify the flavor of the broth/gravy, without adding more water/steam condensation to the chicken. If not, I guess I could also remove the chicken after cooking as suggested and reduce the drippings in the pressure cooker via saute mode. Then add back to the shredded chicken. I haven’t tried it that way, but I imagine it would work well. I would anticipate that it may slightly effect the cooking time though having that extra pot in the liner. Please let us know how it turns out for you! I followed the recipe for salsa verde chicken and they came out too tough. To be honest, when I checked the pressure cooker, the display had shifted back to “On” from the time, so I may have missed the beep that indicated the cooking time was done. Did I overcook them? Hi Denise, yes it sounds like it got overcooked. On an Instant Pot it will start counting after it is done cooking so you know exactly how long it has sat past the set time. It continues to cook while under pressure past the cook time, just an extra 5-10 minutes can result in the rubbery chicken. Sorry it didn’t work out for you! I have hard water. It causes the meat to be tough. I’ve learned to add a tsp of baking soda to the water when I pressure cook meat. It comes out great! Thanks for the tasty recipes! If I’m using frozen chicken it says to cook for 20 minutes, does mean the veggies cook for 20 minutes also? does this make them too soft? They veggies are just onions, bell peppers or celery, which are totally fine to get soft! It actually makes them a little bit sweeter which is great in the recipes. I just got my pressure cooker and tried the Spicy Mexican Chicken. It’s now a household favorite! It tastes so much like my favorite local Mexican restaurant. Even my 2 year old loved it! Can’t wait to try the others! Thank you! Hi Danielle! I’ve already made a few of these great easy recipes. Do you think you could sub boneless pork chops for the chicken? (Not frozen) would there be any cooking time difference? Thanks! Happy to hear you have enjoyed them so far! 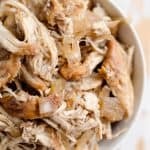 Are you wanting to make shredded pork? If so, I would suggest cutting up a roast into chicken breast size pieces instead of pork chops. I don’t think chops would shred up as well. I have made 8 out of 10 of these recipes and honestly each one is really good. So fast and so easy. Stocking up my freezer for when I have surgery next week. Also riced up some cauliflower and froze it raw in individual snack bags as well as packets of cooked spaghetti squash. Your recipes have just enough juices to really flavor these two veggies. Very pleased with results. Thank you. Oh man, I’m thrilled to hear you have made so many of these and loved them! The spaghetti squash and riced cauliflower are such smart additions for a healthy meal! I have been looking high and low today for a Mexican Chicken recipe that didn’t include a jar of salsa and/or taco seasoning. This looks PERFECT, and everything else looks delish, too. Thank you! 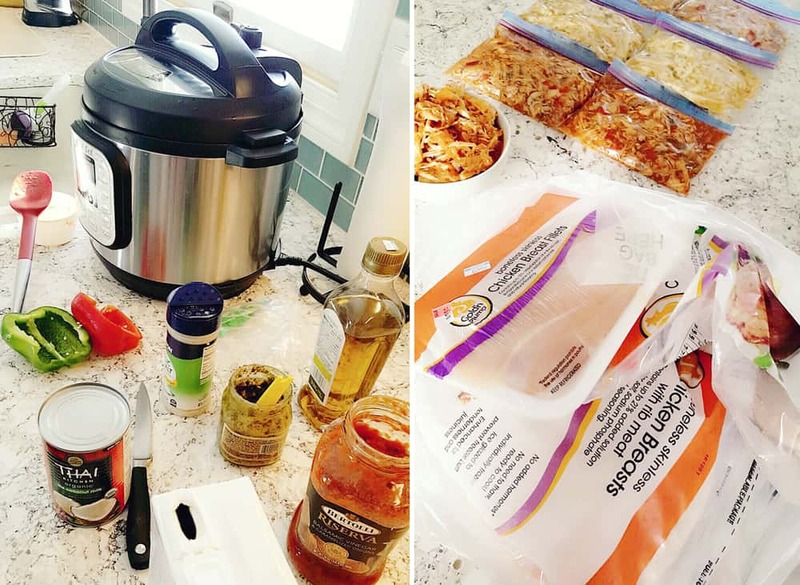 I’m confused….it looks like you prepared freezer meals, but the instructions for the crock pot appear to be for cooking the meals immediately. Can you specify how to cook the meals if using the freezer packs that have been thawed? To reheat the meals immediately, you can microwave them. 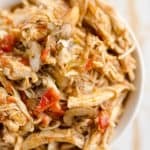 If you are making something with the shredded chicken, I recommend thawing the chicken in the refrigerator overnight and cooking it into a flatbread, egg rolls, enchilladas, etc. I am a newbie how hasn’t used her IP yet. I love chicken, but I can never cook it correctly, hence getting the IP. I work nights and was thinking about freezing individual portions for me to reheat at work. Do you think reheating them in a microwave would dry out the chicken or would it help to put in the fridge the night before and then put it in my cooler? Thanks for the fantastic ideas with chicken. I have reheated the portions in the microwave and because there are plenty of extra juices, they don’t dry out at all! I am the only one in my household. Would it be possible to cut the recipes in half? And if so, how long would I cook using thawed chicken? And how long for frozen chicken? Hey Rose, you can cut the chicken and vegetables in half but you would need to keep all the same liquid amounts, because an electric pressure cooker requires 1 cup of liquid minimum. After the chicken cooks, you would just want to reserve more liquid out because there would be less chicken to absorb it all. I’ve made several of these and they’re all so yummy!! One quick question: when you say to use the extra liquid for making rice, do I just use that in place of water when cooking rice? I guess that adds some flavor to the rice? Yes exactly, just swap the liquid out for water and it adds great flavor! Happy to hear you have enjoyed many of the chicken recipes! When I says to reserve liquid for cooking rice, is that for cooking rice in the instapot or separately? Is I possible to cook the rice with the chicken? That liquid is meant for cooking rice at a later time, perhaps when you thaw the cooked chicken if you are using the recipe to prep. It is possible to volker rice a5 the same time as chicken, it is called PIP Rice (pot in pot), but I haven’t perfected that recipe yet. You can find many recipes for it online though. I made the teriyaki one tonight. Used 1 lb frozen chicken, same amount of other ingredients, and added one cup brown rice and an extra one cup broth. 22 minutes. The rice was not quite cooked, so next time I will do a few more minutes. But very tasty regardless! When the recipe says to reserve liquid for cooking rice, is that to cook the rice in the instapot after the chicken is done? Is there a way to cook the rice in the instapot at the same time as the chicken? Oops didn’t mean to post that twice. Is there any other way to reheat the leftovers than in an instant pot because i don’t have one maybe like in the microwave or crockpot…. btw all these meals sound delicious! Certainly! I have reheated them in the microwave many times. Thank you! I’m trying this tonight. My daughter has a soccer game (that I forgot about) and a 12-minute dinner on the table is just what I need! I am brand new to owning an IP. What setting do I use on the IP – steam, or manual, or ? Manual and then use the arrows to adjust the minutes. Good luck! When you say “Vent” do you mean a natural pressure release or a quick pressure release? This would be a quick pressure release. Thank you SO much for the recipes Danielle. I plan to try all of them. I cook for our family here. My wife loves crock pot meals and I have only collected a few, but now I have ten more! Every one of these look delicious! Again, thank you! All of these recipes look fantastic. I’m just wondering if you have any directions for cooking procedures/times for cooking rice, potatoes, or carrots with any of these dishes. After very long days at work, I just want to make all – in -one meals that I can cook and serve quickly. Thanks! What a fabulous post. I have been using my electric pressure cooker for about five years and these recipes are great. I’m going to give some of these recipes a try, as I am taking my pressure cooker on our beach vacation to make dinner for our family. I am looking for some new recipes to mix it up a little and I really appreciate this well thought out and detailed post. I am new to blogging and your post is a really good inspiration. Hi I plan on making these for my husband for work as freezer meals. Can he take them and put them in a Tupperware and then microwave at work several hours later? Or can I reheat on the stovetop and put in a Tupperware and he can microwave to warm it at work? I would pop them in the refrigerator the night before so they are no longer frozen, then just microwave in the Tupperware at work. Best of luck! These recipes look great, but I’m wondering if you’re at high altitude. The cook times for your chicken are about twice what I use. Nope, I am in Minnesota and these times have always worked great for me. You can always experiment with it and try less. I love the versatility of these recipes! I made the salsa verde chicken tonight, it was great! I don’t have an IP, but a Hohm pressure cooker (that didn’t come with the best instructions) and it is really opening up possibilities in my kitchen! Do you have any nutritional information on these recipes (I am doing Weight Watchers). Thanks! Thru all sound delicious. If I were to use bone in chicken breasts, how much more time would I need to add to my electric pressure cooker? It really depends on how thick they are. If they are pretty thick I would add a few extra minutes. Keep in mind, if they are undercooked, you can always add more time and bring back to pressure! These are great and will make dinner time easier and more efficient for our family! Thank you for taking the time to put this together!! These recipes sound great but I only have 1 pound of chicken. Do you know how to much to adjust cooking time for the pressure cooker? you should just need to reduce the time by a couple minutes. These all sounds amazing! I can’t wait to try them! I was wanting to meal prep for my lunches this week, could I make a couple of these and just put them in a plastic Tupperware container and store them in the fridge for about 3 days or do they have to be frozen? It would be easier for me to grab a meal from the fridge and pop it in the microwave at lunch time! These would easily store in the refrigerator for a few days! So am I reading that you made them ahead of time and then freeze them? Or can I put all ingredients in the ZipLoc bag, freeze and then pull out to cook?? So I made everything and then froze them, but you could certainly freeze everything raw and pull out to cook as well. You would just need to let it thaw enough so there was liquid to build pressure. Yes, just add a few minutes to ensure the chicken is cooked through. Do you have any recipes for chicken thighs that result in keeping the whole chicken thigh, rather than shredding the meat? Not in the Instant Pot unfortunately. 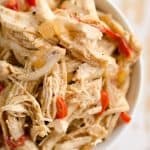 Can I use boneless chicken thighs instead of breasts in the Salsa Verde Chicken? And adjust the time down a few minutes? Yup, that should work just fine! These look simple, delicious and diet-friendly! One question though: for the electric pressure cooker method, why do you remove 2/3 cup of the liquid instead of reducing it by simmering? Aren’t you throwing out some of the flavour? Oh – should have mentioned that, as I detest rice, I wouldn’t use the removed juices for cooking it! Haha, just saw this after responding. I made the spicy Mexican version last night and reduced the sauce anyway. It was fabulous. Even with the reduction it had lots more sauce in it than your photo suggests it should have though. Not a problem as far as I’m concerned – I like my food sauce heavy. In a moment of weakness I also stirred in a couple of tablespoons of Philly ‘Lightest’ at the end which made it lovely and creamy for very little fat/calorie cost. I have the Thai Peanut Chicken ready to blast in my pressure cooker right now and, yes, I did make your peanut sauce for it. I’m not sure how I’ve had the restraint to keep enough for the chicken, it is grade A gorgeous! Thank you so much for these recipes. I’m fairly new to pressure cooking and they’ve really helped me understand how I can adapt my own recipes to use this method. Yum, that creamy Mexican version sounds awesome. The Thai Peanut Sauce is my FAVORITE! So happy to hear you enjoyed it. You could definelty reduce it, but I was aiming for a quick recipe. Also, that extra liquid is great for making rice. Hi Danielle, I just bought my Instant Pot and look forward to cooking some of these. Question how long will these stay in the freezer after cooking them. I plan on putting them in my snapware containers. If you keep them in a container that seals out the air, they will keep well for about 6 months. Hello, I just bought my instant pot. can’t wait to try these recipes. the extra liquid. do you freeze that also?? and how long to they keep? Yes, you can freeze that liquid if you don’t use it to make rice or something else. It freezes well for 6 months. I made the Italian Chicken as my first Instant Pot recipe and it turned out great! Thanks so much! Hi Danielle- I’m new to IP’ing. These recipes look delicious…thank you for the detailed instructions!! You mentioned that if you have an 8qt IP to increase the liquid. Do you know roughly how much I would increase it? Also – if I have a really thick piece of chicken and cut it in have, do i need to adjust the cooking time? Hi Katey, I believe the 8qt pot needs 1.5 cups minimum liquid as opposed to the 1 cup minimum for the 5 & 6qt, therefore I would increase the liquid by 50%. As for the chicken, if it is one of those really thick pieces, I would cut it in half. If you do that, there should be no reason to increase the cooking time. Best of luck! Thanks for all the great easy recipes!!! Thanks Tracey, I hope you enjoy them! The recipes sound delicious. Can you add the rice to the Chicken Teriyaki recipe and cook it all at the same time? If so how much would the cooking time change and do we need more liquid? I haven’t tried it with rice so I’m not sure on times or amounts. I love the serving suggestion ideas! That is always the hardest part for me. I didn’t see anywhere in your instructions or ingredients to add water our broth, but habe used the IP long enough that I added 1 cup of broth. Trying the Hawaiian! I’m interested to know how you felt about adding the cup of broth. I had the same question… wondering how much or what we are supposed to add in ADDITION to the recipe. I have an 8 qt. unit. I can’t wait to try these recipes. Well laid out and great tips at the end. I learned so much just reading them, I’m a new-be with the IP and can see some of the mistakes I’ve been making. Plus, reserving the liquid for later it a great idea. Thanks for sharing these! I like all these reciepes they are mostly what I cook with for insta pot. BUT our favorite the Thai chicken i stuggle with cooking and need help it will burn before coming up to pressure every time. multiple times even i clean scub in out and pour the ingredients back in and never fails at least twice. what am I do wrong? Have tried frozen and thawed chicken, always use your Peanut Sauce, have added extra, and have tried not to saute in it before. dont know what else to try.😣help! So based on the peanut butter and coconut milk you use, the thickness of the sauce will vary. Seeing it’s not working for you, I’d swap out 1/3 cup of the sauce for chicken broth to thin it out. After it cooks, take off some of the thin liquid and stir that 1/3 cup peanut sauce back in. This will keep the flavor but allow it to come to pressure easier. Can I c adapt these recipes to a regular pot (not up or crock) and freeze any leftovers? I like all the combination of ingrediants. You should be able to bake all these in a deep pan but the amount of liquids will be too much and unnecessary. I would cut out any additional broth and you should be good to go! These all look delicious but where is the nutritional information? You can find the nutritional information by inputting the one you are wanting into My Fitness Pal! It really is so convenient isn’t it! My question is for Honey Teriyaki Chicken recipe. I do not want to use honey, because ” Heated honey can actually produce delirious effects in the body and can be fatal at the same time”. How much of brown sugar I should use to replace honey in this recipe? Thanks. I would use 1 Tbsp + 1 tsp of brown sugar as a substitute. May I use can chicken instead? We really enjoyed the spicy Mexican chicken recipe. I cut the raw chicken into bite size pieces ( not a fan of shreds), subbed mild hatch green chili for jalapeños and pressured for 7 minutes. I removed the suggested amount of liquid and thickened the remaining amount with a cornstarch slurry – it made a very nice sauce. I’m going to cook some rice with that reserved liquid to go with the leftovers from yesterday. Thanks for a great recipe. The formatting of the recipes is confusing. I am smart enough to know that I don’t use a pressure cooker and then use a slow cooker … but you should reformat these so it does not show both in a “1 through 6” step recipe.